Older drivers are coming away from simulations with different perspectives as well, as the simulations challenge their own habits and assumptions by showing how excessive speeds during cold weather or oversteer and understeer can affect the truck and its trailer. Speeding, following too closely and overconfidence are the cause of many accidents across the nation each year, and the simulator is showing drivers just how important it is to slow down and drive appropriately for conditions. Our Chicago truck injury lawyers recognize that the motorists who share the roads with trucks are just as responsible for keeping the roads safe and may not always respect the limitations that commercial truck drivers face. These simulations show the impact of cutting in front of a truck without giving it enough space to react and the catastrophe that can result when following a truck too closely. For example, it is a good idea to advance at least two truck lengths ahead of a semi before moving in front of it, as this will allow the driver enough space to slow down in the event you have the sudden need to stop. If you are driving in cold weather, be aware of how the cold may impact the ability of trucks to stop or make sudden maneuvers. Ice and snow greatly reduces a truck’s stopping distance and can cause a jackknife if the truck driver is forced to turn too quickly. 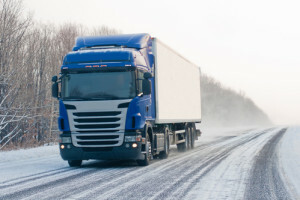 Giving truck drivers enough space is an excellent practice regardless of whether it is cold, wet, dry or warm out and can prevent needless accidents. Rosenfeld Injury Lawyers LLC has represented thousands truck accident victims and their families following catastrophic accidents that have changed their lives forever. Our access to a comprehensive network of medical specialists, expert accident reconstruction specialists, social workers and an award winning legal team allow us to help you receive the specialized care that you deserve and to make sure that you recover the compensation needed to pay for it. Contact us today to arrange a free consultation with one of our qualified Chicago truck accident attorneys to learn more about your legal options and what we can do to provide you with the best chances of a successful recovery. We work on a contingency fee basis, which means we guarantee that we will only collect a fee when after we settle or win your case. If we cannot do so, our services are free of charge.